Its breathtaking beauty reflects the infinite majesty of God. 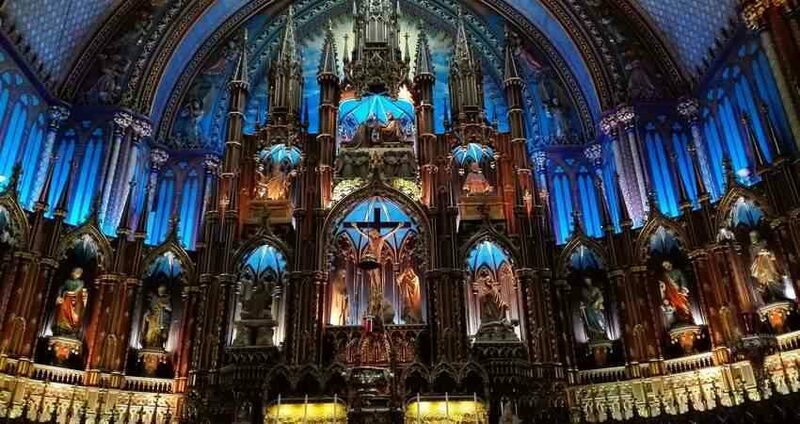 The Basilica of Notre Dame in Montreal, Canada, is a church of special magnificence. Built over a 17-year period in the Gothic revivalist style, it is the first church in Canada erected in this style. Pope John Paul II raised the church of Notre Dame to the status of a basilica on the occasion of his visit in April of 1982. Notre Dame de Montreal is a true work of beauty. The front of the basilica has two imposing towers, and in the middle of the facade there are three archways. Above the arches, there are three statues: at the center is a statue of the Blessed Virgin Mary, on the right a statute of St. John the Baptist and on the left St. Joseph, patron of Canada, gazing out over the square with a look of paternal concern. The interior of the Basilica is breathtaking. Above the main altar is a touching depiction of the death of Our Lord with His mother, Mary, and St. Mary Magdalene weeping at the foot of the Cross. Directly above this is another scene of Jesus as King crowning Mary as Queen of Heaven and Earth with a dazzling blue background, which evokes a feeling of awe and wonder. Behind the altar, there are several lighted alcoves featuring several Apostles. The ceiling above the altar is stained glass, providing a beautiful yet natural way of illuminating the sanctuary. The ceiling of the Basilica is an impressive dome of blue, dotted with hundreds of stars, reflecting the infinite beauty of God. One of the Basilica's greatest treasures is undoubtedly the magnificent old Casavant Freres pipe organ. Dating back to 1891 this organ has 7,000 individual pipes ranging from 32 feet to a quarter inch. In a sense the majestic reverberations of the organ symbolize the unwavering voice of the Catholic Church. The carved wood pulpit is another marvelous piece of craftsmanship with its statues of the Old Testament prophets Jeremiah and Ezekiel. All the characteristics of the Basilica's architecture, the detailed stained-glass windows, the intricately designed walls and ceiling, and the vibrant colors provide us with a profound insight into the infinite beauty, majesty and perfection of God. The Basilica of Notre Dame de Montreal is arguably one of the most outstanding examples of gothic architecture in Canada. It is a great reproduction of the marvels born during the Middle Ages, the golden era of Christian Civilization.